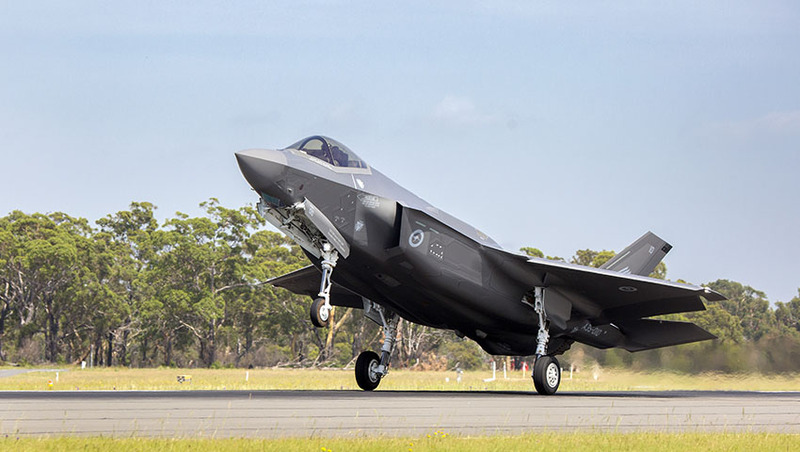 Defence Connect can confirm that the first two of Australia’s planned 72 F-35 Joint Strike Fighters have successfully landed at RAAF Base Williamtown for permanent basing following a series of flights across the Pacific. Both planes, pilots and doting parent – the Royal Australian Air Force – are doing fine as the nation welcomes its first two fifth-generation fighter aircraft. The delivery heralds the beginning of a new era for Australian air combat capability. The route saw A35-009 and A35-010 depart Luke Air Force Base in Arizona early last week, crossing the Pacific with a layover in Hawaii. On the homeward stretch to RAAF Base Amberley in southern Queensland from Hawaii, the F-35s were supported by in-air refuelling by Royal Australian Air Force KC-30A Tankers. The aircraft made their final dash to RAAF Base Williamtown early this morning, wowing onlookers as they performed an aerobatic display with RAAF F/A-18 Hornets. Defence Minister Christoper Pyne officially welcomed the fifth-generation jets: "This is the most advanced multi-role stealth fighter in the world. It will deliver next generation capability benefits and provide a major boost to our intelligence, surveillance and reconnaissance capabilities. The Joint Strike Fighter is the largest acquisition in the history of the Royal Australian Air Force, and is a key part of the government's $200 billion build-up in defence capability." Fifth-generation fighter aircraft represent the pinnacle of modern fighter technology. As a fifth-generation aircraft, the F-35 is a blend of all-aspect stealth even when armed, low-probability-of-intercept radar, high-performance airframes, advanced avionics and highly-integrated computer systems bringing a gods-eye view of the battlespace. Greg Ulmer, vice president and general manager, F-35 program at Lockheed Martin told Defence Connect, "The aircraft is lethal, survivable and connected, which means it is a potent force multiplier. As a multi-role, multi-domain aircraft, the F-35 brings a transformational capability to Australia." Commander Air Combat Group, Air Commodore Mike Kitcher, described the F-35 as providing a 'quantum leap' in capability for the Air Force. Both the RAAF and the broader ADF will need to rewrite the operational, tactical and strategic doctrines that have held true for the better part of the last 75 years, he told Defence Connect. "F-35 presents a quantum leap, not only in terms of operational realities, but also technologically. For Air Force in particular, but again also for the wider ADF, F-35 is a catalyst for developing a truly fifth-generation force," AIRCDRE Kitcher said. "We at Lockheed Martin are dedicated to continuing engagement with our Australian industry partners. We realised that we couldn’t do it by ourselves, it is great to see that so many Australian companies are now benefitting from the genuine opportunities created by the global partnership to create high-end industry skills across the country," Lockheed Martin Australia chief executive Vince Di Pietro told Defence Connect. "The aircraft represents a transformational opportunity for Australia, not only for the Air Force, but also for Australian industry. Every F-35 rolling off the production line in Fort Worth has Australian components. Who makes these components? It is small and medium-sized companies that proudly contribute best-of-breed components, made in Australia," Di Pietro told Defence Connect. The F-35 will provide more than just a quantum leap in capability for the RAAF and the individual warfighter. The aircraft will be responsible for supporting thousands of jobs around the nation. Minister for Defence Industry Steven Ciobo welcomed the contribution made by the F-35 to Australian industry: "Australian industry is manufacturing parts that will be fitted to every F-35 in production globally, and more than 50 Australian companies have directly shared in $1.2 billion in production contracts to date." Defence set the key target for Australian industry participation in the F-35 program to be between $6-9 billion of production and sustainment work through to 2050. "It is really exciting to see the fires of Australian industry reignite to get involved with the advanced and high-tech manufacturing opportunities presented by the F-35 program," Di Pietro added.